I have been seriously looking forward to Brenda Cooper’s newest book, The Creative Fire, for a while now. Why? Well, Brenda is smart and she’s a darn fine writer. I’ve enjoyed everything of hers that I’ve read. Take a look at the catalog copy for her new book. Ruby Martin expects to spend her days repairing robots and avoiding the dangerous peacekeeping forces that roam the corridors of the generation ship The Creative Fire. Her best friend has been raped and killed, the ship is falling apart around her, and no one she knows has any real information about what’s happening to them. The social structure on board Creative Fire is rigidly divided, with Ruby and her friends on the bottom, but she dreams of freedom and equality. Everything changes when a ship-wide accident reveals secrets she and her friends had only imagined. Now, she has to fight for her freedom and the freedom of everyone she loves. Her enemies are numerous, well armed, and much more knowledgeable than Ruby. Her weapons are a fabulous voice, a quick mind, a deep stubbornness, and a passion for freedom. And complicating it all—an unreliable A.I. and an enigmatic man she met – and kissed – exactly once—and one of them may hold the key to her success. 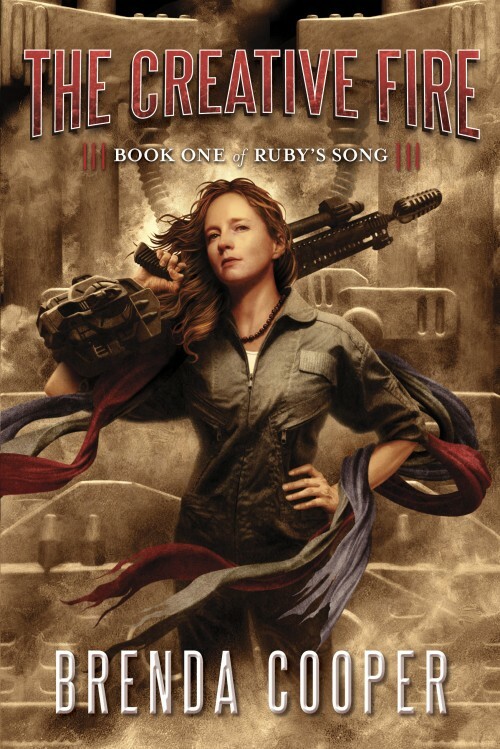 If Ruby can’t transform from a rebellious teen to the leader of a revolution, she and all her friends will lose all say in their future, and nothing will ever change. Pretty cool, eh? So what’s Brenda’s Favorite Bit? It has actually been tough picking out a favorite bit; I loved working on this story and there were a lot of fun parts. I think the best was bringing Ruby to life. I started out researching my historical character model, Eva Peron. I watched video documentaries and the popular film, read books (including one purportedly written by Evita), and did Internet research. What emerged was a complex character full of the contradictions that become the public record of any famous figure. So research only got me part of the way to character. It gave me her youth and her drive and her origins from among the poorest classes of a generation ship. It gave me her sexuality and her success. But the real Eva Peron remains murky, and my character didn’t feel complete yet after that work. I could see her through her people, but not from the inside. From there I built a setting to would work for a future version of Eva. Ruby needed to be opposed by a strict and somewhat patriarchal enemy. I gave her the officers and peace-keepers of her people. I chose the ultimate closed world. I had her born on the working levels of a generation space ship so long gone from home that no one alive remembers a sky, and so closed off that the lowest levels of humans aren’t sure how big the ship actually is. Along the way I had my doubts about whether someone so young could actually be as powerful as I needed her to be. And I really wanted Ruby to be real – to be more nuanced and less perfect than many heroines. Purely by chance, I came across a New York Times article about a college student named Camilla Vallejo, who was leading student protests in Chile. In Camilla, I had a real-life role model for Ruby. I don’t speak Spanish, so I didn’t model her actual protest language, but I tried to capture a similar level of energy and passion. I also watched videos of Severn Cullis-Suzuki, who is a well-spoken young woman from Canada who addressed the UN brilliantly as a young girl and who still speaks out for the environment. That gave me Severn, Camilla, and Evita herself to borrow the “feeling” from to create Ruby. Ruby became none of them, all of them, and yet herself. So I finished the book, and I had my heroine. Or at least, I thought so. Then one day I stood in the rain across from the University Bookstore in Seattle, waiting in a line with Nancy Kress to see some Oscar nominated shorts. John Picacio called me. Stop and contemplate this for a minute. I’ve been a fan of Nancy’s work for years. Now we’re movie buddies. Not just that night, but often. One of my favorite SF artists in on the phone. I know I’m an established writer, but I don’t FEEL that way. So the whole moment is surreal, like I stepped into someone else’s dream. John wanted to know what Ruby looks like. I didn’t have the manuscript in front of me: I was in a cold rain on a busy street and could barely even hear John. John DOES have the manuscript in front of him, and he’s read it. He couldn’t tell what she looked like from my words. I knew she has red hair and she’s beautiful and looks more innocent than she is. I knew that in the opening scenes she is really pissed off. But I couldn’t tell John what her uniform looks like or how long her red hair is. This is mortifying. I should know these things. Over time, John and I worked through the myriad details, and he came up with the beautiful cover art that’s on the book today. From the first draft I saw, I knew John had captured the thing I had been working for – Ruby’s force of character. I had to keep the beautiful art secret, but as I did final revisions on the book, I put a window with the art in it next to the window with my work in it. Having her image helped make the work more powerful. I could be in the middle of a scene, and ask myself what Ruby would really do, and look at the art, and know. It almost felt as if she were talking to me – not in a crazy way, but in the way that all creative endeavors seem to tap parts of us that aren’t in the easy access level of our brains. So, creating Ruby was my favorite part. She’s wild and strong, and a bit of a schemer. She’s both selfish and selfless, and has an innocent streak that borders on the naïve but is born of her age and the depth of her hopes. I created her to be extraordinary and imperfect, and I hope that you enjoy reading about her revolution aboard The Creative Fire. As a side note, you can enjoy the artwork in John Picacio’s 2013 Calendar, which he is doing as a Kickstarter. See Lone-boy.com and click on Calendar for more information. I think at the moment Ruby will be July. And for more information about this series, or my other work, see rubyssong.com or visit www.brenda-cooper.com. Brenda Cooper writes science fiction and fantasy novels and short stories. Her most recent novel is THE CREATIVE FIRE, which came out in November, 2012 from Pyr. The sequel, THE DIAMOND DEEP, will be available in late 2013. Brenda is also a technology professional and a futurist. Brenda lives in the Pacific Northwest in a household with three people, three dogs, morethan three computers, and only one TV in it. For once I am ahead of the curve and have read this one already! And yeah, that is one of John’s best covers, no question.